(Bloomberg) -- Prime Minister Narendra Modi announced India had joined the U.S., Russia and China in an elite group of nations that have the capability to target satellites. 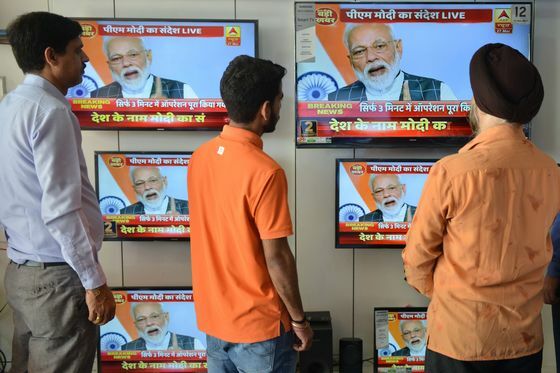 In a televised address to the nation, Modi said India fired a missile to knock down one of its own satellites in low Earth orbit, calling the capability crucial for national security. The shoot-down involved an interceptor from India’s ballistic missile defense program, showcasing the country’s rising confidence in the technology. India’s current missiles are mostly intended for confrontations with China and Pakistan, its foes in one and three wars, respectively. Modi’s address comes just weeks ahead of general elections to determine whether he’ll serve a second term as prime minister. Voting will take place in seven phases between April 11 and May 19, with results to be announced on May 23. India’s Election Commission said it has asked a committee of officers to examine Modi’s address to determine if it violated rules that bar policy announcements before elections. “This address is an indication that Mr. Modi possibly is not very sure of the election campaign going completely his way,” said Nilanjan Mukhopadhyay, a political analyst who has written a Modi biography, adding he may have violated the election code of conduct. “It’s an attempt to bolster nationalist fervor by another means,” Mukhopadhyay said, after realizing the patriotic mood generated by tensions between India and Pakistan was “not sufficient” to continue until the end of elections. Tensions between India and Pakistan escalated dramatically when India launched airstrikes on Feb. 26 to attack what the government said was a terrorist training camp inside Pakistan. The government in Islamabad retaliated the next day, shooting down an Indian jet. India’s initial airstrikes were in response to a suicide bombing in Kashmir that killed 40 paramilitary troops. In 2007, China first used a ballistic missile to destroy its own old weather satellite orbiting 535 miles (861 km) above Earth, while Russia has been testing a missile that could be used to strike and destroy a satellite or ballistic missile. India’s space and missile programs -- along with its economic growth of more than 7 percent and a bid for a permanent seat in the United Nations Security Council -- is a major part of the country’s efforts to build up its defense capabilities and establish itself as a world power.